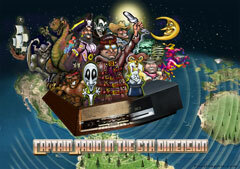 Captain Radio Visits Third Coast Live Theater! Barbara recalls originally feeling “a little like we were so geekie and ‘unusual’”, though, in retrospect, she now feels more like a “pioneer” as classic audio comedy/drama has made its comeback through, first, web simulcasts, then broadcast streams, and, most recently, podcasts. Gradually, the troop developed a voice and style all its own. By mid-decade Barbara had become a consummate networker, and one of her connections, San Francisco comedy writer Jim Cranna, encouraged TCL to push on full-steam with their popular modern culture spoofs. The troop’s success producing original material in live performance peaked in 2005 in a fateful theatrical run, grimly referred to thereafter as the “Lakewood Event”. TCL booked a performance run at the lavishly restored 1930’s East Dallas Lakewood Theater, and, for the first time, entrusted event marketing to a third-party. Unfortunately, the underwhelming marketing campaign drew paltry attendance. Barbara recalls bitter-sweetly a cast member receiving a C-Note tip from a prominent, and sympathetic, patron after one of their performances. Encouraged professionally to tackle “Westerns,” another easily-spoofed genre, TCL will soon release its first tongue-in-cheek episodes of Frontier Notary and The Loan Arranger. Meanwhile, with tentative backing from no less an audio production luminary than Yuri Rasovsky, Barbara Turning soon hopes to land grant money to write and to produce a compressed timeline docu-drama on the disenfranchised San Francisco area Native-American tribe, the Ohlones. … so be sure to drop by your friendly neighborhood Third Coast Live Theater web site at thirdcoastlive.net.